Image: Design proposal for the Tanforan Assembly Center Plaza, December 2016. Design by Harold Kobayashi/Royston Hanamoto Alley & Abey (RHAA). Courtesy of RHAA Landscape Architects. 2017 GUH-Townsend Fellow Valentina Rozas-Krause has published an article on "Memorializing the World War II Japanese American Incarceration at the Tanforan Assembly Center" in the Fall/Winter 2018 Issue of History & Memory. 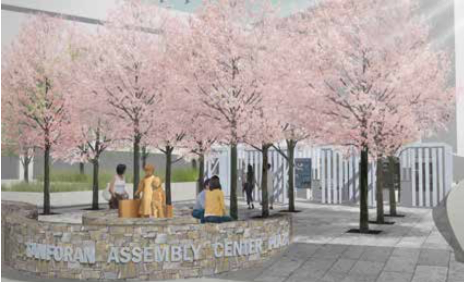 A series of on-site historic plaques and a photographic exhibition at a nearby train station serve as background to study the development of a new memorial to remember the wartime incarceration of Japanese Americans at the Tanforan Assembly Center in San Bruno, California. The design and iconography of the future Tanforan memorial are analyzed alongside the motivations of the main actors that have shaped it: a group of memory activists, a transit agency and a shopping mall developer. The article concludes that these past and future commemorative interventions reveal the relationship between an unsettled memorial landscape and the Japanese American community's ongoing demands for apology. You can read a preview of her article here.